The Jim and O score: 9 (dreary boys, “Because nothing can ever be perfect.”). 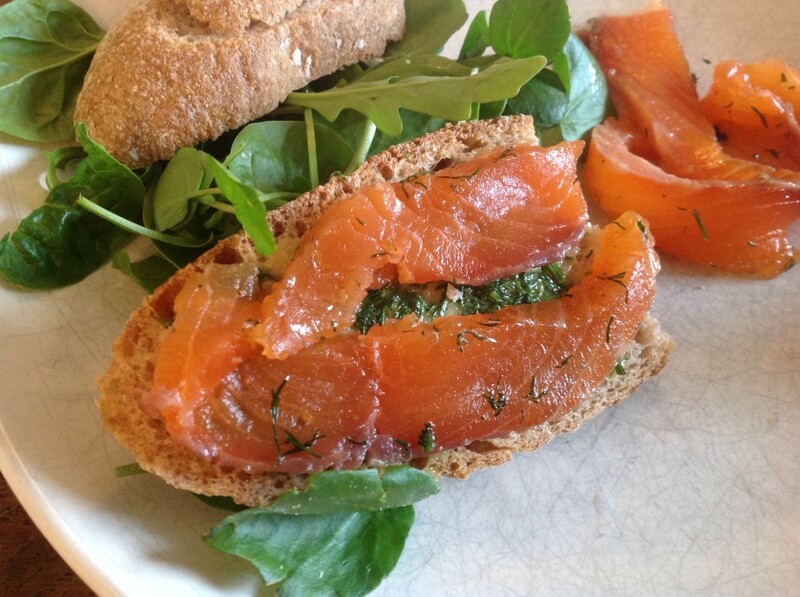 I bloody love gravadlax and have it far too rarely. Similarly pancakes, dry fruit salad, roll mop herrings – all these kinds of foods related to a specific time of year go unloved for the remaining 11 months, when in fact they would make mealtimes more exciting, and break up my usual go-to foodstuffs. Anyway, this one has taken me a long time to do. Excuses, excuses, but really there was an excuse – firstly Christmas then getting a new job (before then being struck by LAZY). Hoorah! Down with stupid hours, up with interest and niceness! 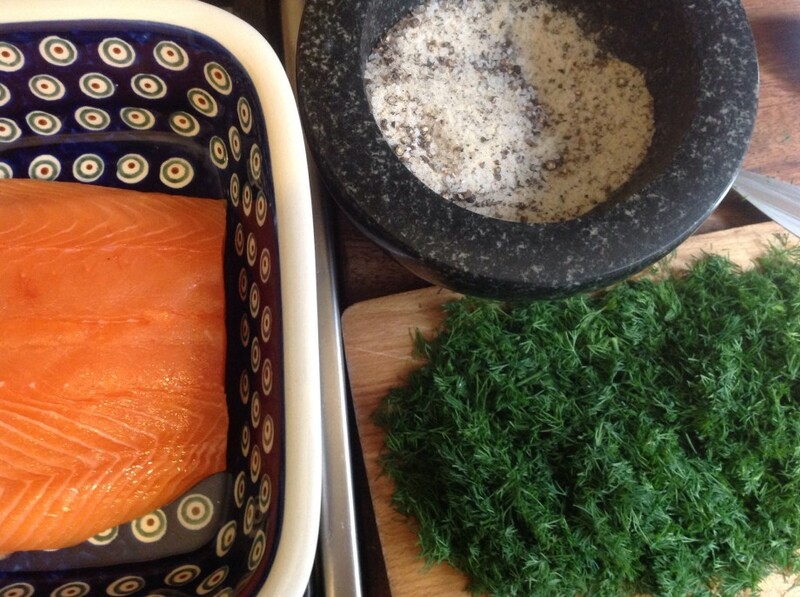 And so, the recipe – after a very quick search, I settled on my old favourite, Felicity Cloake who had tried and tested many recipes already, for this wonderful Gravadlax. This really was such an easy thing to make. All it takes is time, no complicated steps at all. After agreeing with A&O that they would eat it, I made it, ready for a weekend visit to their lovely home in the countryside. 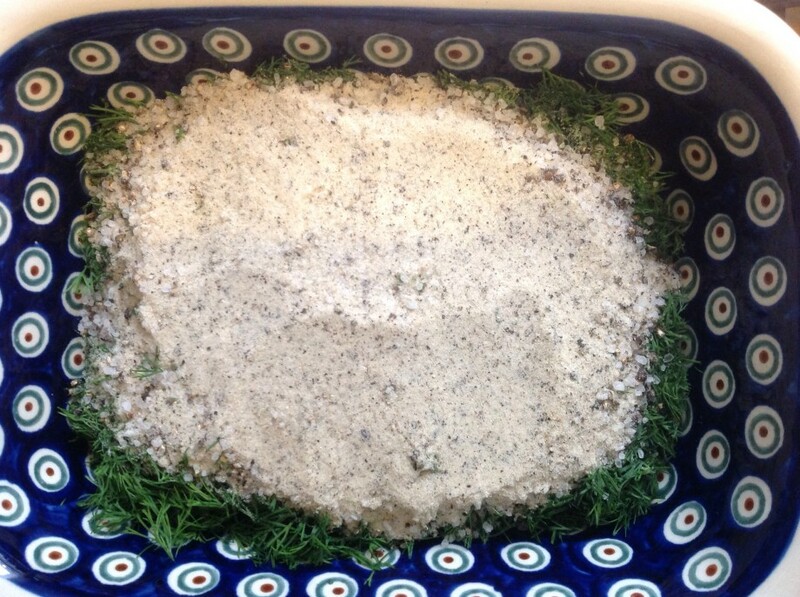 It was to be ready for Saturday lunch, so I started the curing on the Thursday morning preceding our visit. I had also frozen the side of salmon before to be sure there were no naughty bugs remaining to make me or my friends sick (how embarrassing would that be?) 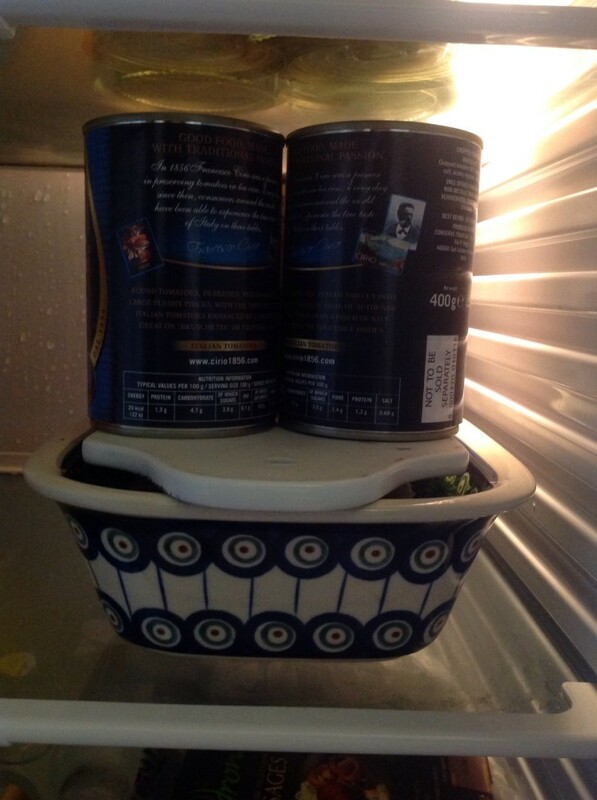 so made sure it was out of the freezer on Wednesday evening. 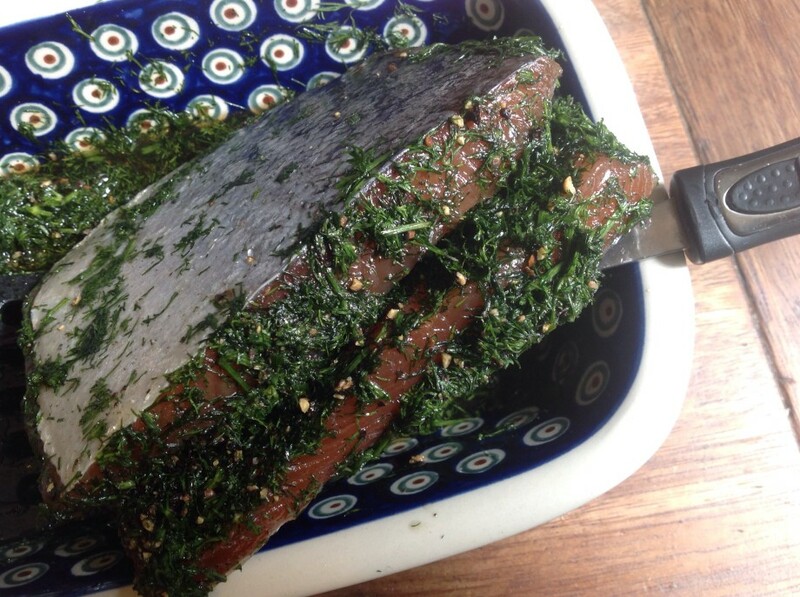 Use the thicker part of the fish – ultimately you will be using two pieces atop one another whilst curing. The thin tail end would get too salty and briny to be edible, so cut that off (it made for a lovely work lunch, poached). 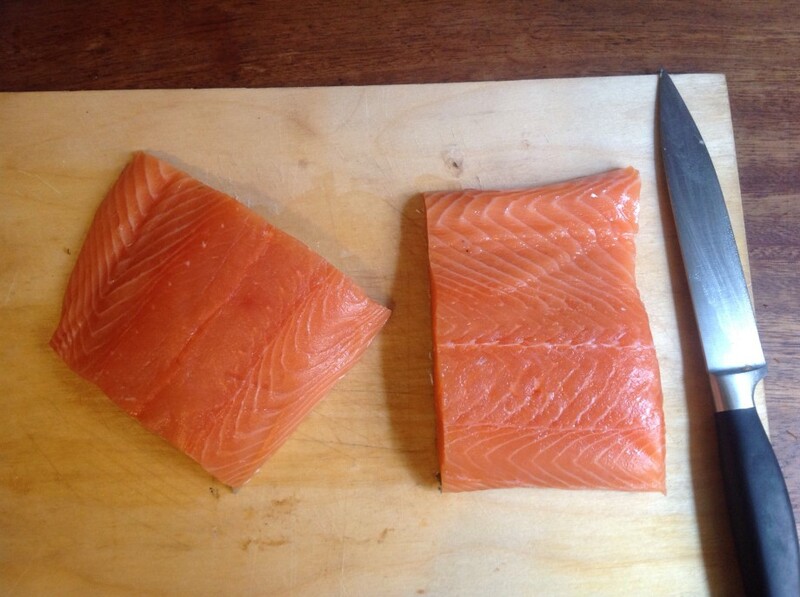 Then cut the remaining fillet in two, equal sized pieces of salmon. Weigh out your peppercorns, caster sugar, coarse sea salt. Crush the peppercorns in a pestle and mortar, add in the sugar and salt and mix the dry ingredients together. Chop up all the lovely dill (why don’t I use dill more often? ), stalks and all and you’re ready to go. 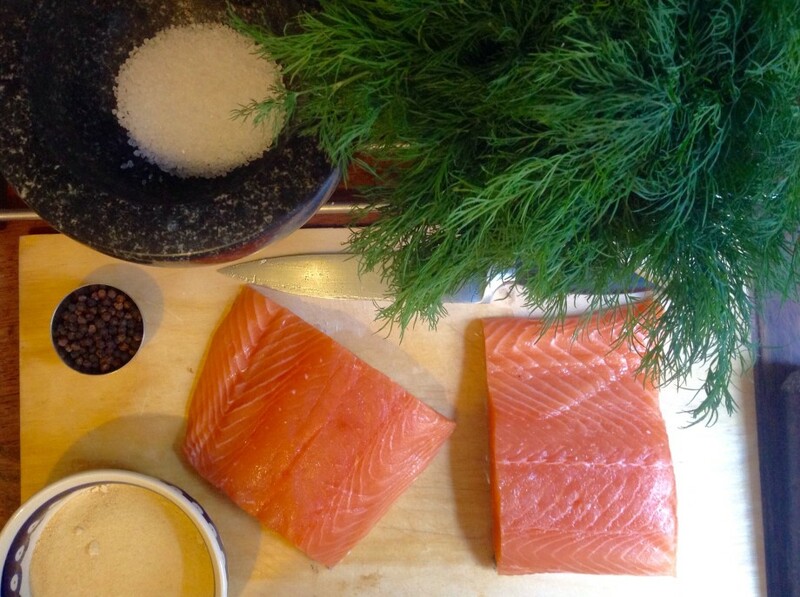 Put a piece of the fish, skin side down in a dish, cover with half the chopped dill, then the dry mixture, on top of that, add the rest of the dill and place the other piece of fish, skin side up make a big dilly, salty, sugary salmon sandwich. 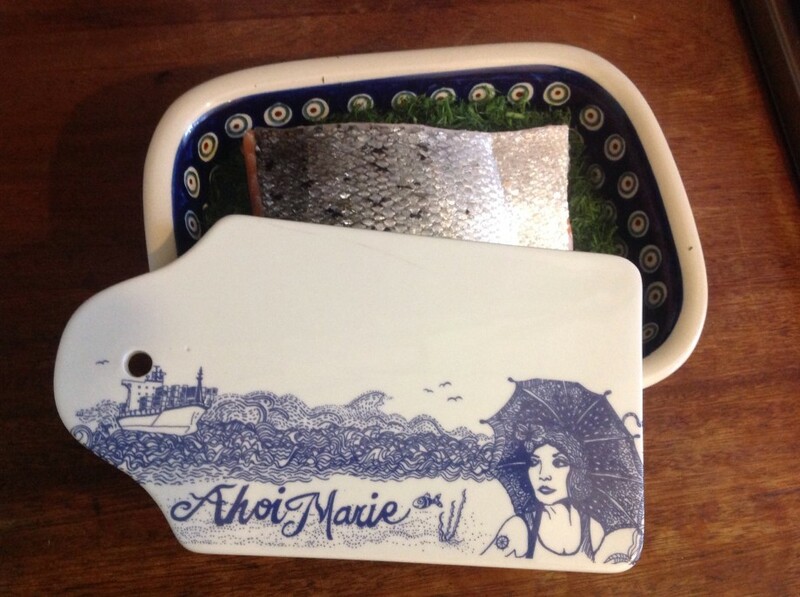 Put a board or equivalent on top of the fish, weigh it down and pop in the fridge. From then on turn the whole lot of layers every twelve hours. What’s happening here, I would imagine is that the salt-sugar mixture is drawing out the liquid from the salmon, whilst the salmon is also soaking up the flavour of everything covering it. When turning, I saw how the salmon had changed colour and texture – becoming much more dense and solid to the touch and deeper in colour. Then on the morning of the visit, I quickly made up the sauce. Again, a very simple task which resulted in a delicious sauce. Mustard, dill, oil, vinegar and sugar – mix everything together, then add the finely chopped dill, and mix again (incidentally I made double the amount as I had plenty of dill which has since made a wonderful topping to smoked mackerel in my lunch box and A&O had their extra with some pan fried fish). 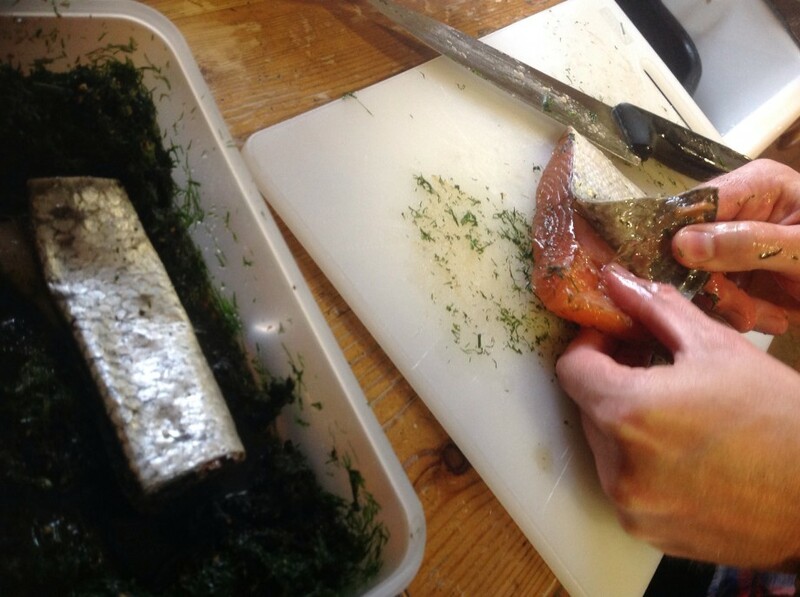 Once the sauce was done and we had driven south I presented the ‘finished’ product to O who fished out the salmon, scraped off the excess goop and dill then set about tearing off the skin (this actually worked very well – I would have made a mess trying to cut it off). He then sliced it into thinish strips. A note here to say that one should avoid the outer edges as these were very salty indeed, and rather unpleasant. The lot was demolished with rye bread, a few salad leaves and some crisp white wine. I would definitely do this again, and probably wouldn’t have bothered trying had Dave not set this challenge. Thanks Dave! What’s next!? Oh, well done! That all looks delicious. 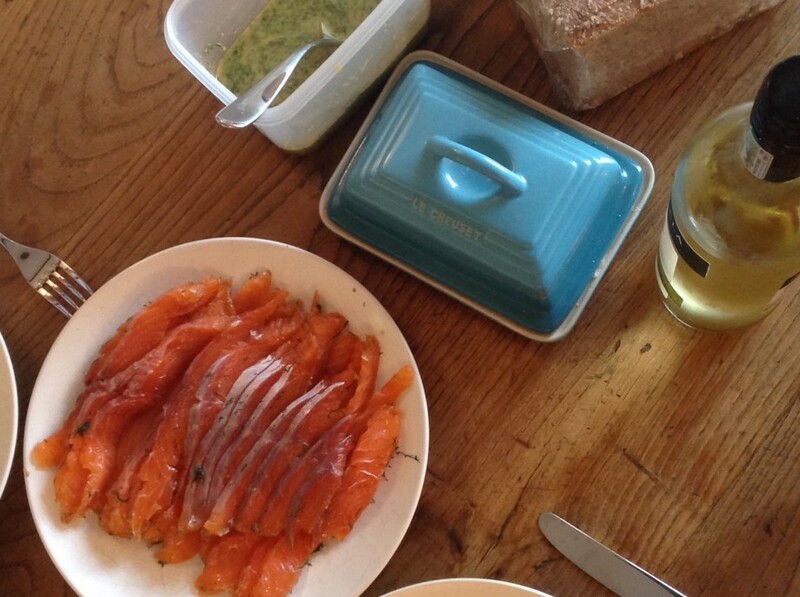 It’s ages now since I made gravadlax – I really should do that again. 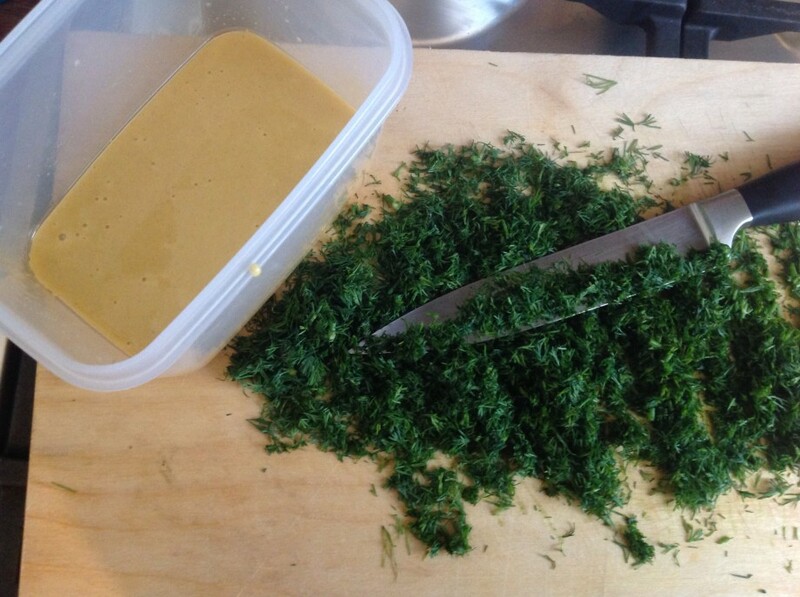 Good plan, making double the sauce – dill sauces are always delicious, and you can never have too much. Yay! You are back in the kitchen. I have to say I would never have chosen to eat this dish if Dave hadn’t made it. It’s really very nice isn’t it. And it is such a summery looking thing and such a great colour. Unlike you two, I don’t like the flavour of dill all that much. But nevertheless this dish was good. 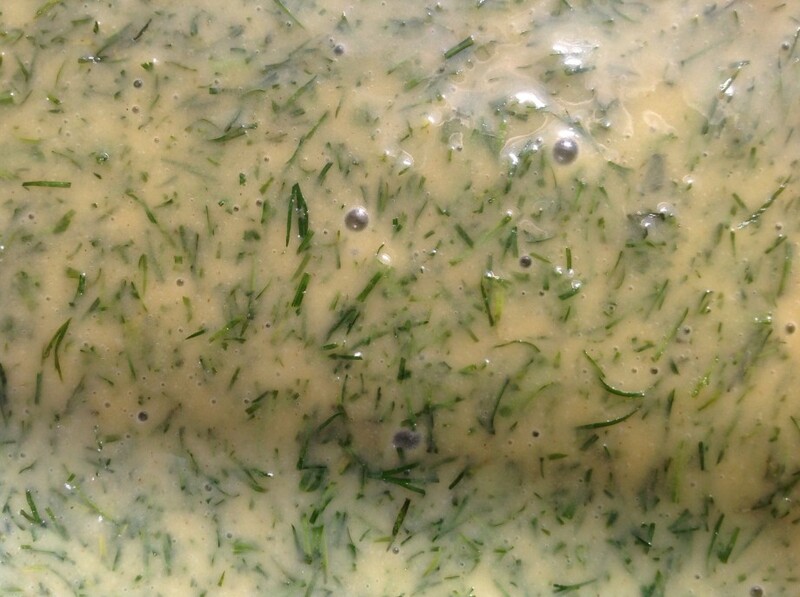 I’ve never thought of making this but I’d definitely like to try it now looking at your mouth-watering pictures – and I love dill, so just the sauce for other uses sounds great.